Jules-Amédée Barbey d'Aurevilly (2 November 1808 – 23 April 1889), was a French novelist and short story writer. He specialised in a kind of mysterious tale that examines hidden motivation and hinted evil bordering (but never crossing into) the supernatural. He had a decisive influence on writers such as Auguste Villiers de l'Isle-Adam, Henry James and Proust. His best-known collection is The She-Devils, which includes the cult classic Happiness in Crime and is still in print from Dedalus Books. Une vieille maîtresse (An Elderly Mistress, 1851) was adapted to cinema by French director Catherine Breillat: its English title is The Last Mistress. He is variously lumped in with the Late French Romantics, The Decadents, Symbolists and is included in the Genealogy of the Cruel Tale and The Romantic Agony. He is considered a practitioner of the Fantastique and a dandy. Paul Bourget describes him as a dreamer with an exquisite sense of vision, who sought and found in his work a refuge from the uncongenial world of the every day. Jules Lemaître, a less sympathetic critic, finds in the extraordinary crimes of his heroes and heroines, in his reactionary views, his dandyism and snobbery, an exaggerated Byronism. Beloved of fin-de-siècle decadents, Barbey d'Aurevilly is a classic example of the manner of which the Romanticists were capable and to read him is to understand the discredit that fell upon that manner among the later Victorians. 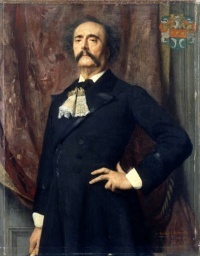 He held extreme Catholic views, yet wrote on the most risqué subjects (an apparent conflict more troubling to the English than to the French; Voltairiennisme would have been something else) he gave himself aristocratic airs and hinted at a mysterious past, though his parentage was entirely respectable and his youth humdrum and innocent. Jules Amédée Barbey d'Aurevilly wrote tales of terror in which morbid passions are acted out in bizarre crimes, such as Les Diaboliques [The Diabolical Women] (written in 1858, published in 1874, no relation to the film). Also of note is L'Ensorcelé. Other fiction that is sometimes considered Symbolist is the cynical misanthropic (and especially, misogynistic) tales of Jules Barbey d'Aurevilly. He was born at Saint-Sauveur-le-Vicomte (Manche) in Normandy. In the 1850s, Barbey d'Aurevilly became literary critic of Le Pays. Inspired by the character and ambience of Valognes, he set his works against the social pattern of the aristocracy of Normandy. Although he himself did not write in Norman, he encouraged the revival of vernacular literature in his home region. Jules-Amédée Barbey d'Aurevilly died in Paris and was interred in the Cimetière du Montparnasse. In 1926 his remains were transferred to Saint-Sauveur-le-Vicomte's cemetery. Une vieille maîtresse (An Elderly Mistress, 1851), attacked at the time of its publication on the charge of immorality. L'Ensorcelée (The Bewitched, 1854), an episode of the royalist rising among the Norman peasants against the first republic. Les Diaboliques (The She-Devils, 1874), a collection of short stories, each of which relates a tale of a woman who commits an act of violence, a crime, or revenge. Une vieille maîtresse (An Elderly Mistress, 1851), attacked at the time of its publication on the charge of immorality; it was adapted to cinéma by the controversial director Catherine Breillat: its English title is The Last Mistress. Les Diaboliques (The She-Devils) 1874, a collection of short stories, each of which relates a tale of a woman who commits an act of violence, a crime, or revenge. Unless indicated otherwise, the text in this article is either based on Wikipedia article "Jules Amédée Barbey d'Aurevilly" or another language Wikipedia page thereof used under the terms of the GNU Free Documentation License; or on original research by Jahsonic and friends. See Art and Popular Culture's copyright notice. This page was last modified 13:15, 27 November 2017.